The five-year-old was among the leading contenders for the two-mile feature following a recent victory at Goodwood and jockey George Baker had the 15-2 second-favourite well positioned from the start, racing in midfield against the rail. He remained full of running passing the three-furlong marker and quickened nicely through a tight gap to give himself every chance a furlong out. Willie Mullins' Max Dynamite came from the clouds to try and mount a challenge as the line loomed, but Quest For More showed no signs of stopping and was well on top as he passed the post a length and a quarter to the good. Max Dynamite was second, ahead of Nearly Caught in third, with last year's one-two Angel Gabrial and Suegioo close up in fourth and fifth respectively. 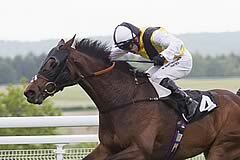 Favourite Seamour was bang there a furlong out before weakening into sixth place. Baker said: "He travelled great, we needed a smooth run through and we got it. "The key to him is his high cruising speed, and he has the ability to get out of trouble. "We were drawn well, but you still need a smooth passage and he was slow to stride so I was a bit further back than I wanted to be. "This race is very hard to win, as every year there are so many hard luck stories. "It's normally such a rough race, but I had such a smooth passage round. When he got there he was just playing with me a little bit. "He's improved so much through the winter, he is much more straightforward and willing and every year he keeps improving. "Roger is very patient with his horses and is extremely good at what he does." Martin Harley rode Max Dynamite and he said: "It was a great run, there were no hard luck stories from me. Willie left me with a blank page for instructions and I could do what I wanted. I just missed the kick slightly, which meant I was four-wide turning in. "He finished off really well, but I saw George was still on the bridle and I knew he'd be hard to beat." Robert Havlin, rider of Nearly Caught, said: "He's run a cracker and he might have nearly won if the race was last night as he prefers a bit more cut in the ground."